Will was the subject of a Halloween picture last year on this blog, and here he is again. I think he looks fierce! 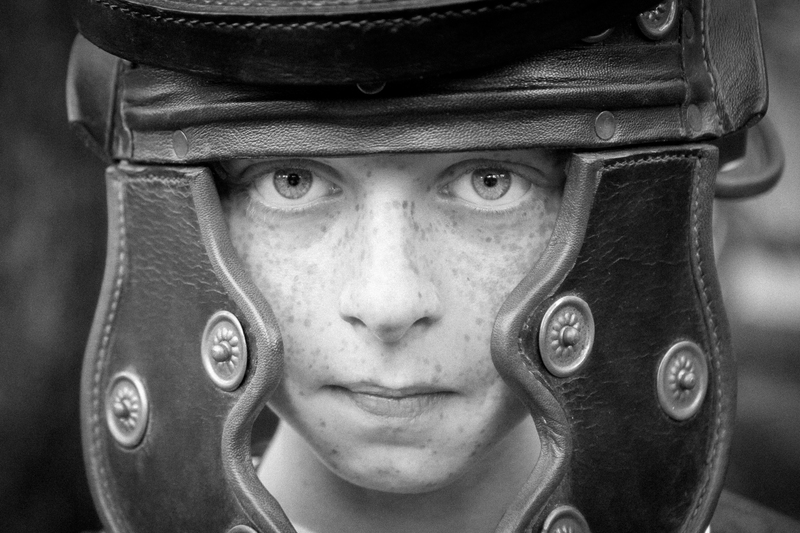 He blew every penny of his vacation spending money during our summer visit to France in the gift shop of the Roman amphitheater in Nimes on this leather replica of a legionary’s helmet. He was determined to wear it on October 31st this year and he carried it off brilliantly. I really love this picture, and I think that his personality shines through, particularly with the edit that I used. He’s inquisitive, intelligent, can be both serious and incredibly light-hearted, a truly entertaining 11 year old to be around. I took this image at around 6:30 in the evening with my Canon DSLR paired with my 17-55mm f/2.8 lens. My settings were ISO 400, aperture f/2.8, and shutter speed 1/160. I did a lot of editing to the photograph in Lightroom 4, starting with a crop which aimed to place him squarely in the center of the image, whereas originally he was situated to the right. I also converted the picture to black and white. I decreased the temperature and contrast, increased the tint and the exposure, decreased the highlights, shadows, blacks and increased the whites. I finally decreased the amount of the highlight priority in post-crop vignetting, and then increased the amount of grain in the image. I’m very satisfied with my edit and had fun playing around with the settings. This photo was taken just before Halloween at the 8th grade Halloween dance. 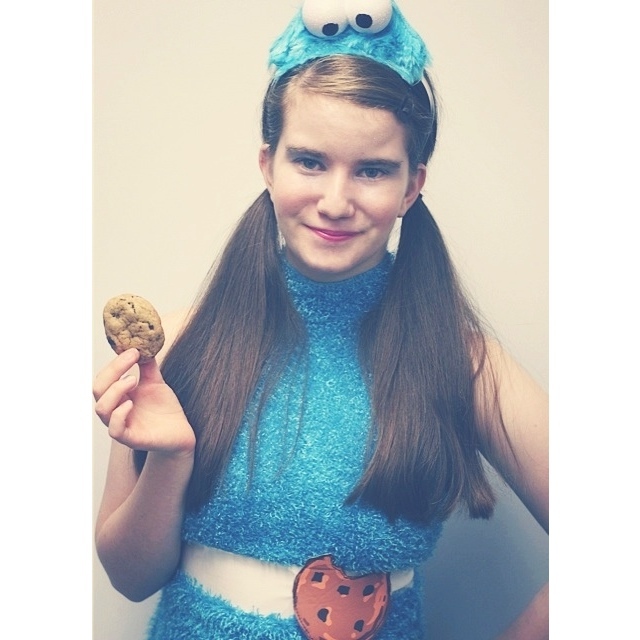 And I have to say, my daughter was the cutest Cookie Monster I have ever seen. This was actually the first year that Libby didn’t know six months in advance what she wanted to be Halloween and we actually stumbled upon this at the Spirit store. If you know my daughter, she has a huge sweet tooth, so this was very fitting. I both shot and edited this photo on my iphone 4. It was taken using artificial lighting and the edit was done in pic-tap-go. I then cropped the photo in the squareready app so I could download onto instagram. I also used the photo for my projectlife365 prompt “costume”. “Me want cookie, Me eat cookie”~Cookie Monster! What cute kids, love that bnw pic….such an adorable Cookie Monster! !